This step in the disassembly strategy is focused on removing the Mustang wiring harnesses from this classic mustang. Before I can remove the main under dash harness there is quite a few items that need to be disconnected and removed, some of these items have already been prepared for removal during the last phase of the disassembly strategy “engine compartment”. I leave the hoses connected to the washer pump and pull them through the firewall. 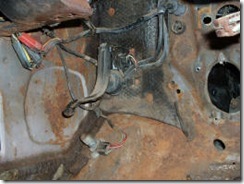 Disconnect all wiring to headlamp harness, engine compartment and tail lamp harness and remove the main underdah harness from the mustang. 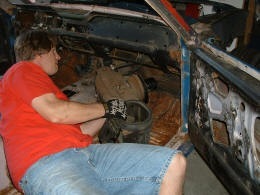 Then continue and remove the head light harness and tail light harness. hey average joe’s, if someone could post something about how to patch a frame and replace a roof panel that would be great! I am having problem’s..What I have is my Hi beam light comes on very low, when I turn my headlight on. They are on low beam & I have already replace the Headlight switch & dimmer switch at the same time. Everything else seem to be working fine. But I did notice that my 2.5 Amp. fuse is lose & when I touch it with the test light my dash lights goes off & when I touch it again the light come back on., but the Hi beam light come back on very low light on the dash. 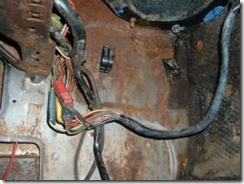 Do you think it’s in my fuse panel? Please advise..